Last week I was at the market and heading to the checkout when a bin of holiday baking items on $1 clearance happened to jump in my path. Jackpot! The top of the bin was full of different varieties of chocolate chips which of course I purchased in excess, including Heath Toffee Bits – double jackpot! At least, I thought so, until I got home. I slid open my pantry drawer and realized that I already have a pretty impressive stash of Heath Toffee Bits bordering on excessive. So instead of stuffing the new bags into the overflowing drawer, I left them on the counter as a reminder to bake something. I don’t know how it slipped my mind that Brian is obsessive about keeping the counter tops clean. Within about 2 hours, he was questioning the massive mountain of toffee goodness taking over the counter top. I decided to appease both his OCD tendencies and his chocolate craving by whipping up Chocolate Toffee Cookies. Let’s face it. I also didn’t want him to see the amount of chocolate chips and toffee bits hiding behind the closed pantry doors as he searched for a spot to put the counter top offenders. Chocolate Toffee Cookies to the rescue, two-fold! Need to sway your honey from that quickly-increasing mound of laundry or the trash bag you forgot to take out? Bake these cookies and make time to enjoy them together. 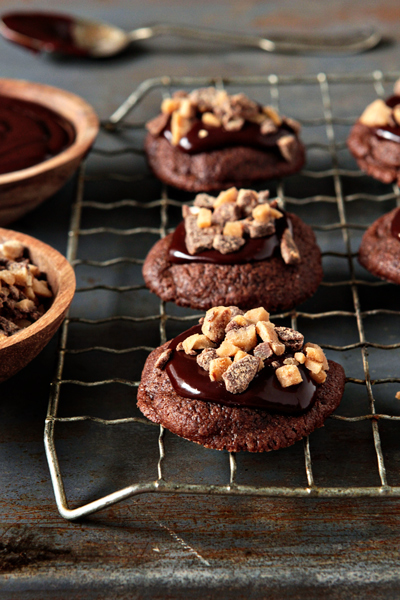 The housework can wait – especially for chocolate and toffee goodness. 1. In a mixing bowl, cream butter and sugar until light and fluffy (about 3 minutes). 2. Add in the eggs, one at a time, beating well after each addition. Beat in vanilla and mix well to combine. 3. In a medium bowl, combine the flour, cocoa, baking soda and salt, and whisk until incorporated. Gradually add the dry ingredients to the butter and sugar, mixing on low until fully mixed. 4. Cover the dough and refrigerate for 2 hours. This will make the dough easier to handle. 5. When ready to bake, preheat oven to 350 degrees F and line baking sheets with parchment paper. 6. Roll dough into 1-inch balls. Place dough balls 2 inches apart on prepared baking sheets. 7. Bake at 350 degrees F for 8-10 minutes or until the edges are firm. Remove to wire racks to cool completely. - You may have a little ganache recipe left over depending on how much you choose to top your cookies with. - The Chocolate Toffee Cookies are best served the day that they are made. Store cookies in a single layer within an airtight container. Oh my gosh! These look AMAZING! I want some right now!! Beautiful pictures, too! I want to swim in that chocolate Ganache!! I’m totally craving this chocolatey goodness right about now :) awesome recipe!! 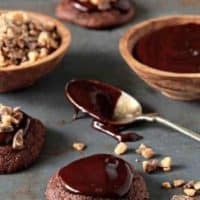 Ohh ganache topped cookies, I have been craving chocolate like crazy this wek and this is not helping:it looks too delicious!! I am also a bit obsessed with a clean kitchen while cooking, I can’t concentrate the recipe if the kitchen is overflowing with bowls and ingredients. Oh my these look gorgeously delicious! Toffee & ganache are a match made in heaven! another cookie recipe i think i can handle! my kids are going to love you (and the husband too). Those look fantastic! Toffee is one of my favorite flavors, but I don’t bake with it very often. I’ll have to give these cookies a try! No toffee bits in Australia but I can close my eyes and taste them now. These cookies look fantastic! Beautiful cookies! I loooove heath toffee candy. This would be my perfect cookie! I bribe my husband with cookies and cream anything when I need to distract him from my lack of household efforts! Those look amazing! I miss Heath bars, but I’m kind of happy that they don’t have them in Germany. They’re so addictive that I just can’t stop eating them. They’re just so yummy! But I imagine that these could be made with lots of different types of candy. I absolutely love the pictures. If you don’t mind me asking, did you make that table? It looks way more interesting than anything I’ve ever seen in a store. Is it some kind of metal? It’s fantastic, whatever it is. These are some of the most delicious looking cookies that I’ve seen in a very long time! I’m speechless! Those look amazing and I adore ganache and toffee. Definitely a must-try recipe. Well..I think the toffee bits are a well deserving counter top clutterer!!! I can’t even express my love for heath toffee bits in words. I will definitely be making these! Oh my goodness, these look awesome. I am sooo obsessed with toffee, I need to try these soon! Heath Bars are one of my very favorites…I eat off all the chocolate and save the toffee part for last. Oh yum! These look amazing!! I love the ganache topping, perfect!!! I think these maybe a good saturday morning cookie to make!! Counting down the minutes until I can get my hands on some of those. Beautiful, Jamie! Thanks for the great idea. Oh my goodness, these look awesome! I love toffee, and of course I love chocolate :D Together in these cookies they must be amazing! These look sinful! If only I had an excess chocolate chip problem…seems like a good problem to have! ohmygosh! these look amazing!! i could probably eat myself sick on these!! no probably about it! i could!! Haha, I like that the story of these cookies involves hiding the truth of your extreme hoarding with baking candies from your husband! anything involving heat candy, i’m there. These look ‘to die for’ – thanks for sharing! You had me at toffee, you locked me at ganache. Gorgeous photos & the cookies sound heavenly! I might need do something crazy (for me) and buy Heath Toffee Bits. These cookies are to die for! These cookies look seriously addicting! these look like they’ll be messy to eat… which is an indicator of AMAZING cookies! How much do I love toffee? Well I firmly believe that my first cavity ever can be attributed to a Heath Bar when I was about 9 years old. So it’s been a long time love for sure. Absolutely fabulous cookies I must make.I’ll call my dentist now. 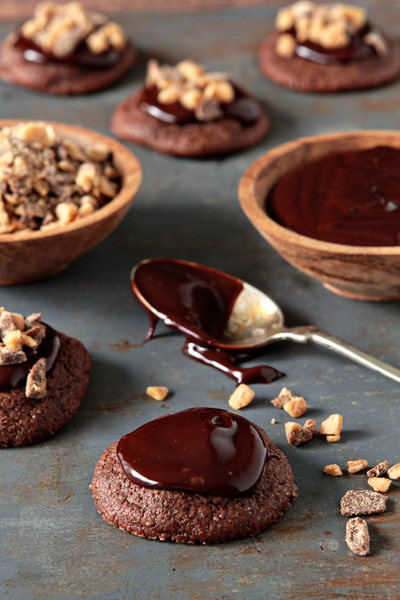 Soft cookie, rich chocolate ganache, and crunchy toffee all in one place? Brilliant. Can’t wait to give these a try. these look amazing. I love all the components, especially the ganache. I am going to attmept to recreate these in a gluten free version. So obsessed that I waking up extra early tomorrow am to bake and create! Thanks for sharing! I love when I find my favorite baking needs on sale, toffee chips being one of them. I actually made these yesterday for a New Years Party. They were so delicious and so chewy. I will definitely be making these cookies again. Thank you! Hello, these look amazing and I can’t wait to make them!! Where do you find the Health Toffee Bits though?